Here is my simple recipe of the week! My family loves to eat german pancakes. I know it’s a recipe meant for breakfast, but at my house it has become a favorite dinner! One time I decided to add berries and whipped cream, and my family loved it so much that is how we make it EVERY time now! I usually make german pancakes in 2 13×9 pans, but recently I tried the mini version and it was a hit! If you haven’t tried these for dinner, do it! Your family will love them! 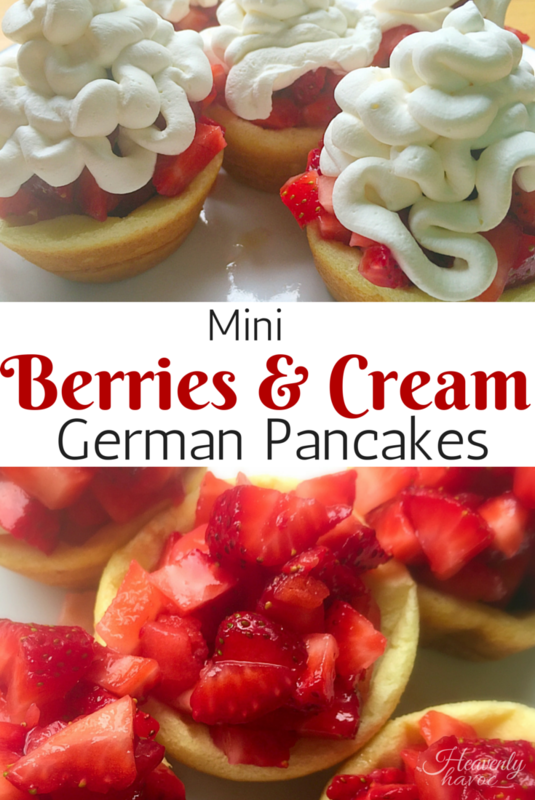 Here is our recipe for Berries and Cream MINI German Pancakes! The great part is how easy it is to make this recipe! You blend all the ingredients for the german pancakes in the blender, pour the batter into a muffin tin (only fill cups half way!) and throw in the oven! While the pancakes are cooking, I dice up the strawberries and whip the cream. You can also use blueberries or any other kind of berry you like! In the winter, we thaw out frozen berries, add a little sugar, and warm them up on the stove while the pancakes are baking. I have never really measured how much sugar I put in my whipped cream. I just add a teaspoon at a time till it tastes sweet enough! The german pancakes will puff up in the over, but after you take them out to cool, they will shrink down and create a small crater in the middle. Perfect for filling with berries and whipped cream! I have included a recipe for 12 mini pancakes, but for my family of 6, I usually double the recipe! Preheat oven to 400. Grease a 12 cup Muffin Tin. Add eggs, flour, milk, and salt to blender. Blend on low speed for 30-60 seconds till batter is smooth. Slowly add in melted mutter and blend again on low just briefly enough to incorporate butter. Pour batter into muffin tin, being sure to only fill cups half way. Place in oven and bake for 15-20 minutes until the pancakes are puffed up and look done. Dice strawberries, add honey, and stir. Whip cream until it is thick with stiff peaks. Add vanilla and sugar till it is sweet enough for your liking. slowly blend in the sugar and vanilla. After pancakes have cooled slightly, top with berries and whipped cream. Enjoy!